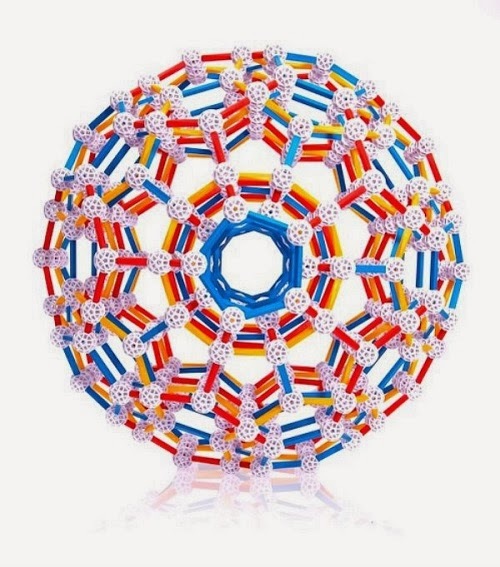 Creatively display your exercise accomplishments visually and automatically. photo: Fat Brain Toy Co.
WHAT: Chalktrail by Fat Brain Toy Co. 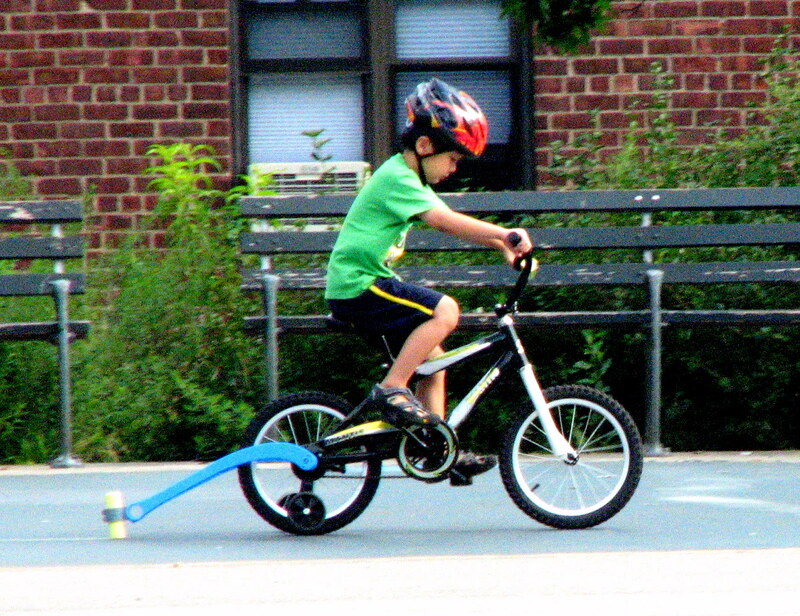 Recently, I instituted a daily AM biking routine for my two boys. Both of the summer programs were over and I was anointed the task of setting up their entire daily routine for 3-4 weeks. At first they were excited to use their bikes since they didn't get to ride too much this summer because they had other things going on (and the summer's heat is horrible here). 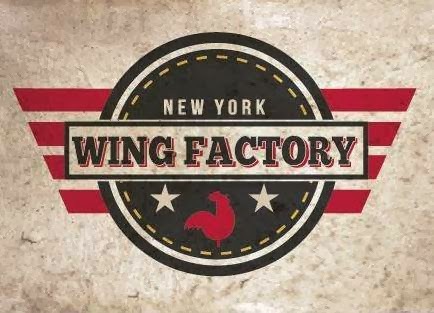 However, as time passed, they got whiny. It wasn't the biking that was hard. It was the lack of routine and lack of novelty that made them crazy. Thus, instead of letting it be an option, I made them carry out a daily AM biking routine to set them in gear for the rest of the day. I literally required them do a certain number of laps around a track before they could call it quits. (Some kids need the crystal clear expectations) They moaned and complained while hiding smiles on their faces. I knew they secretly wanted the drill. Anyway, I knew those endorphins will sneak up on them if they pedaled long enough. As my kids would say, "Easy- Peasy"
Setting up this routine was the perfect backdrop to introducing Chalktrail to my boys. 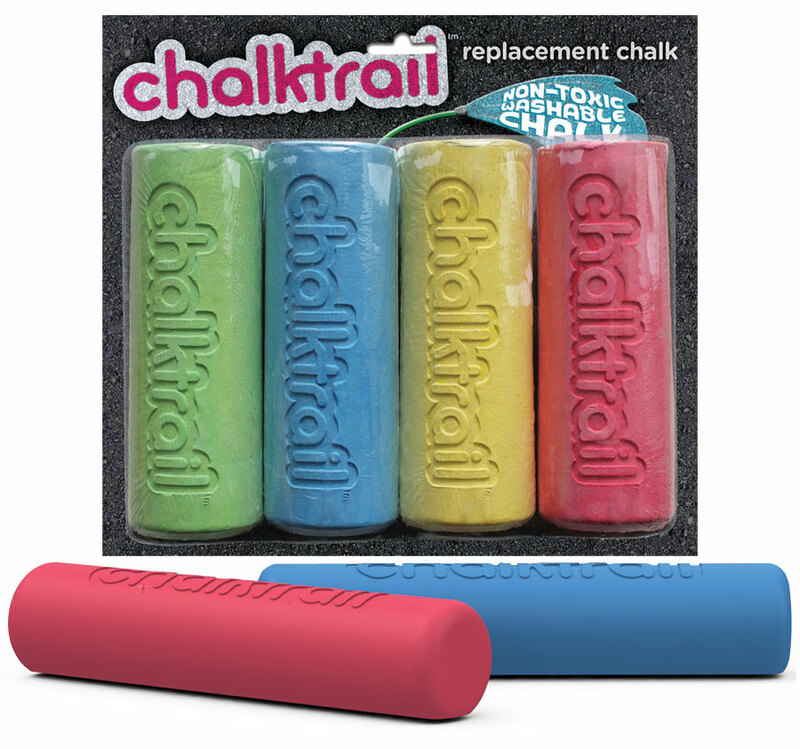 When I first saw Chalktrail in the Fat Brain Toys website, I have to admit, I wasn't wholly impressed. You can say I'm a little old school because I couldn't help but wonder.... "Why is this necessary in life?" Well after testing it, I don't know if I can now say it is necessary but I can tell you that it is surprisingly USEFUL! This video also contains footage of a scooter version of Chalktrail. I haven't seen that yet but it's terribly exciting! Number 1 Son pointed out the first advantage. "Mom, now you'll know for sure how many laps we did!" This was true. Sometimes, they would zip around so quickly that I lost track of how many times he passed me. 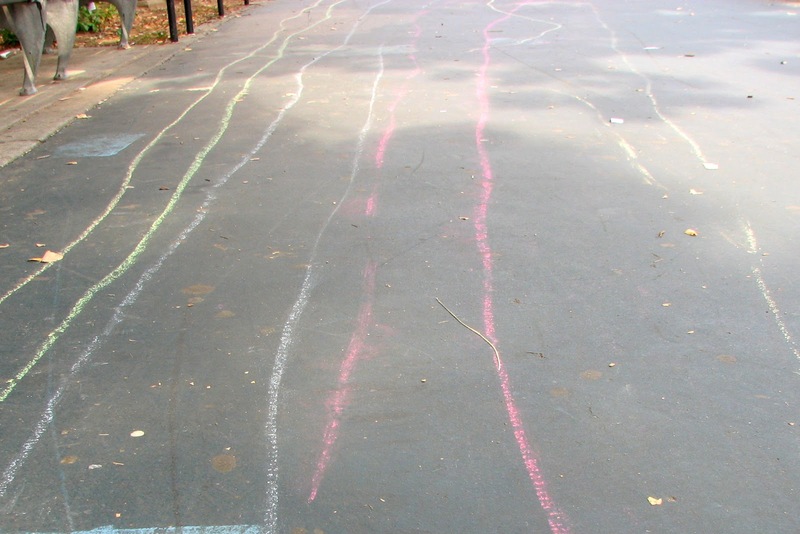 With Chalktrail, there is no room for confusion - the evidence is on the ground. My favorite chalk color is this reddish pink. It's as bright as our Prang chalk which I love. photo: Fat Brain Toy Co. Suddenly biking became fun again. Actually, biking had never lost its charm with us but now it was just way more fun. 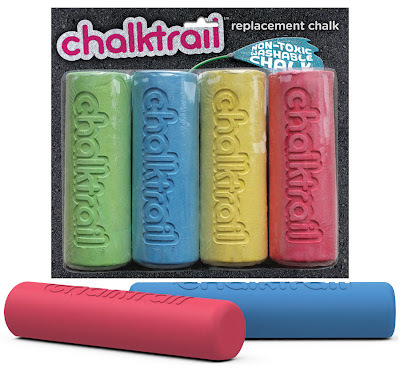 I asked Fat Brain Toys to send me the chalk replacement pack which is actually a variety pack of different colored chalk (Chalktrail comes with one already - white). I'm so glad they did. 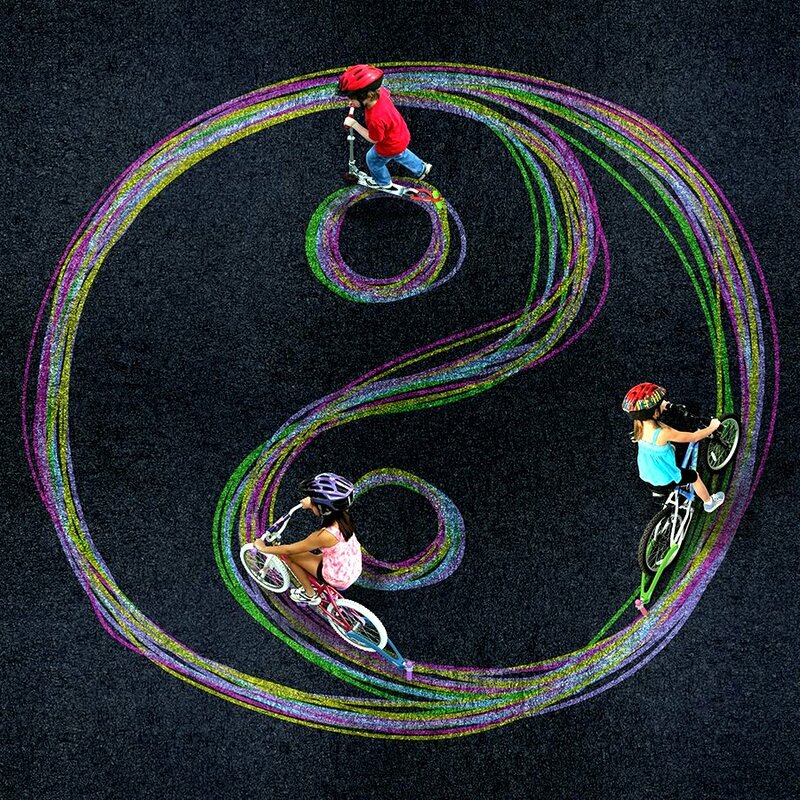 My boys were able to make a rainbow of trails all over the bike track. If you are going to buy Chalktrails, I wholeheartedly recommend you getting the extra chalk in advance, not because the chalk runs out fast but just because variety is good. Folks walking or running on the track would stare at the bike with chalk whizzing by. Everyone gave my son a smile as if they were thinking, "It's good to be a kid." I can't help but think about Russell Crowe in A Beautiful Mind when the movie showed him invisibly drawing the infinity symbol with his bike. Other children's reactions were even better to Chalktrail. My two boys made new friends that day! 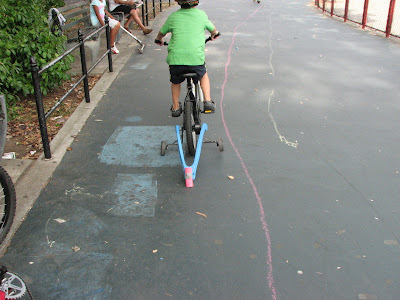 My little guy who is paranoid of someone walking off with his toys allowed a girl to try out his bike with the Chalktrail attachment. He even asked her if she wanted to try it. 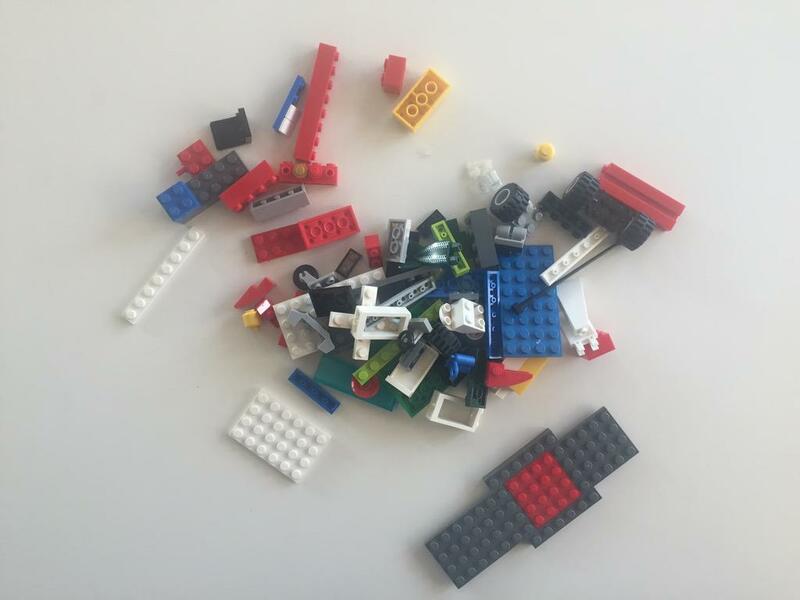 I love how the novelty inspires kids to share their experiences with others. It's just what you need when you want to make friends fast. 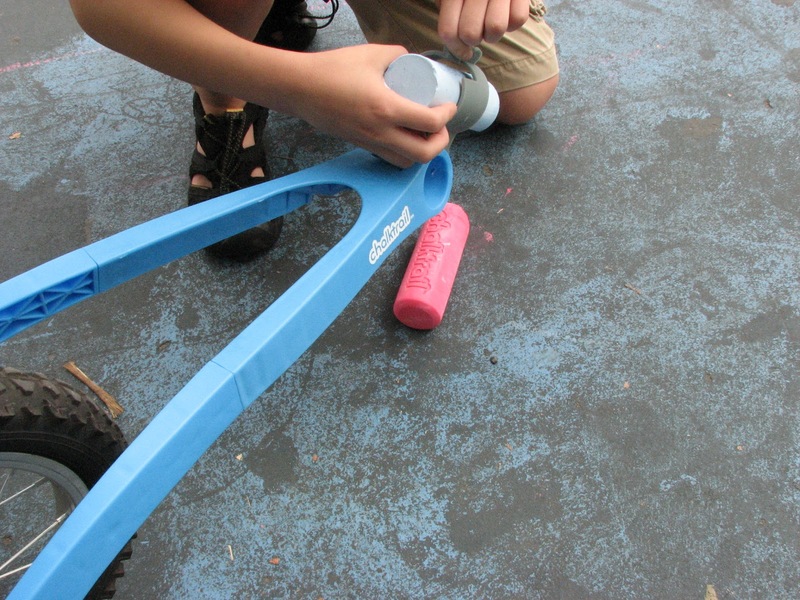 Lastly, you should know this: Attaching Chalktrail to your bike is easy- easy for kids too. It's made of plastic and it is light but sturdy. 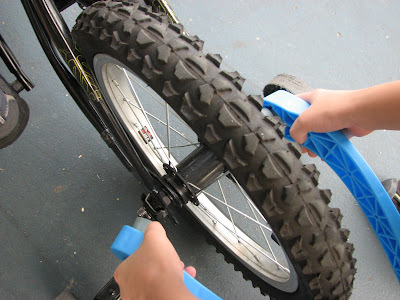 Actually, my eight-year old son put it together within minutes and even attached it to my five year old's bike by himself. Replacing the chalk is quite easy too. With everything being so easy, you might think - what's the point? Well I guess the point is just that- it's easy. Easy is not bad. Easy is good when it's easy to make your mark on the world. Easy is good when it's easy to get noticed at the playground (in a good way). Easy is good when you want to walk away with a visual display of how much exercise you just did. All that equals fun to me and easy is good when it's easy to have fun. 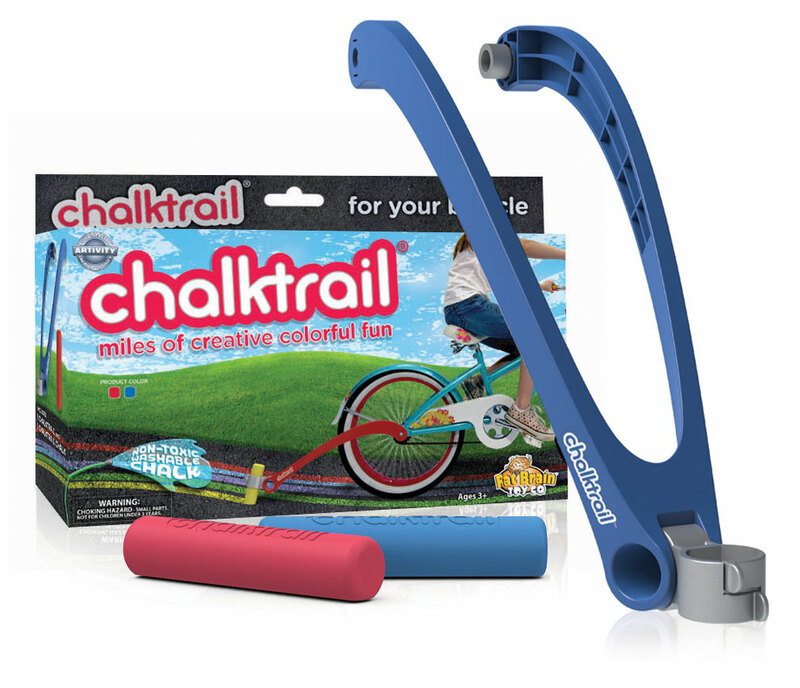 NOW - it's time to win your own Chalktrail! This one ends quickly too- next week Friday on September 15th at 12:01 AM. Want it right now? Can't blame you. Here is my Amazon link. Disclosure: Toys are Tools has not been compensated by any company to release this information. 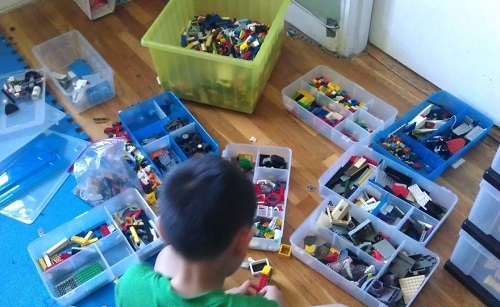 A review unit was sent to Toys are Tools solely to facilitate a review. Reviews are never promised. Oh wow! I think my kids would love this! So fun! Oh, I forgot about the question. lol I think, for our family, it would be the exercise potential. It can be hard to motivate my son to ride his bike! the art potential would be more appealing for me personally, and for my nephews, too, i think. The art sounds so much fun.. they would have to really work at their masterpieces!